Softly sing to your child this classic nursery thyme while teaching different kinds of movement. "Jump" the cow over the moon, "tap" the cat's foot to the music and "slide" the clothespin dish and spoon back and forth along the shoelace. 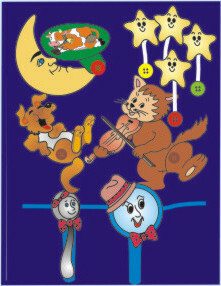 The smiling stars on elastic add pulling and snapping to the fun. This page fastens into one page of theTake-A-Long Tote.